CAS Engineering-DC is one of Washington, DC's leading civil engineering firms specializing in infill development and urban renewal projects within the D.C. Metro area. Through frequent interaction with owners, developers, builders, architects, land use attorneys, regulatory agencies, and other professionals, CAS Engineering-DC continues to develop quality relationships and maintain the highest level of expertise in the land development industry. CAS Engineering-DC is able to provide personalized service catered to their clients' individual requirements regardless of the size or scope of their project. 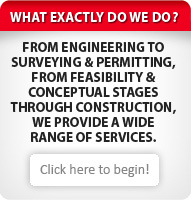 From pre-purchase feasibility studies to land surveying to site design and through construction stakeout and inspection, the knowledgeable staff at CAS Engineering-DC is responsive from start to finish. You can trust that CAS Engineering-DC has the engineering experience you can build on.